Imagine you are a plaintiff in a medical malpractice case. You are suing a prominent (and wealthy) local doctor and a local hospital. One of two potential judges will be assigned to hear your case. Both judges received campaign contributions from the doctor and from defense counsel. In addition, a pro-hospital/pro-doctor lobbying group had spent a significant amount of money to support both judges’ campaigns for office. Both judges, in the course of their campaigns, announced that they would “take on trial lawyers” and “the medical malpractice litigation run amok,” and both judges plan to run for office in a few years when their terms end. But there is one difference between the two judges. In the course of his campaign, Judge #1 wrote and signed a letter to hundreds of lawyers, including defense counsel, personally asking for a contribution to support his campaign. Judge #2 talked to the same defense counsel in the course of her campaign, describing her views and positions on controversial legal issues, but rather than asking anyone for money directly, Judge #2 asked her campaign manager to contact potential contributors. Judge #2 also demanded that the campaign manager tell her immediately who contributes to her campaign and wrote thank you notes to those generous enough to contribute to her campaign. If your first thought is “Boy, I hope I don’t get stuck with that first guy,” then yesterday’s Supreme Court decision in Williams-Yulee offers an important safeguard of judicial impartiality and its appearance. To the surprise of many experts, the Supreme Court upheld a First Amendment challenge to a Florida canon of judicial ethics prohibiting personal solicitation of campaign funds. The Court held that Florida has a compelling interest in preserving judicial impartiality (and the appearance of judicial impartiality), and the canon prohibiting personal solicitation is narrowly tailored to satisfy that interest. In other words, Florida, and the other 38 states that elect their judges, may have a rule in place prohibiting judges and judicial candidates from personally asking for campaign contributions. But if, like me, your reaction is “These two judges are indistinguishable, at least when it comes to appearance of bias”, then the Williams-Yulee decision offers little comfort. After all, both judges are potentially biased in favor of the defense; both judges owe a debt of gratitude to the defendant and defense counsel; both judges will need to keep their contributors happy for the next time they run for office. And the difference between how they solicited the money that they received is beside the point. Now, throughout the opinion, the Court talks the impartiality talk. Justice Roberts’s majority opinion highlights the importance of public perceptions to the judiciary, discusses the fundamental differences between the judicial and other political branches, and provides a strong defense of the need for judicial impartiality. Judges must “apply the law without fear or favor,” repeats Roberts throughout the opinion. Lofty words for a decision that makes so little difference when it comes to any of those things. The rhetoric is almost entirely detached from the minimal (perhaps nonexistent) protection of judicial impartiality created by this decision (or the Florida canon itself). For example, the Court explains that “in deciding cases, a judge is not to follow the preferences of his supporters, or provide any special consideration to his campaign donors.” But we now know that is precisely what happens. Studies have shown that judges do favor the preferences of the electorate, and judges do give special consideration to their campaign donors. And it all happens whether or not judges solicit campaigns directly. The studies showing that elected judges are biased in favor of the political preferences of the electorate as well as their contributors identify a link between judicial contributions and judicial decisions, not judicial requests for contributions and judicial decisions. The Williams-Yulee decision, despite the majority’s paean to judicial impartiality, is no solution to the monumental problem of judicial bias in elected state courts. The decision also does little (if anything) for appearance of judicial impartiality, despite the prominent role that appearances play in the Court’s analysis. A large majority of the public perceives judges who receive contributions from litigants and lawyers that appear in front of them to be biased, and will continue to perceive judges who receive such contributions to be biased. As Justice Scalia explains in dissent, “Neither the Court nor the State identifies the slightest evidence that banning requests for contributions will substantially improve public trust in judges.” Of course not, and that’s because while such direct personal requests make life more difficult for a lawyer (who must say “no” to a judge asking for money), it is not the requests that lead 80% of the public to question judicial impartiality. No, it is the contributions/expenditures themselves. If the holding itself does nothing more than leave states with an impotent tool to fight an overwhelming problem, why am I blogging about it? Is there anything useful to take away from the Court’s decision? Maybe. The most important aspect of the decision, in my opinion, is that the court seems cognizant that standard electoral rules may not apply when it comes to electing our judges. Sure, the Court (or a plurality of the Court, since Justice Ginsburg does not join this part of the opinion) purports to apply strict scrutiny, but Justice Scalia is right that this is not the strict scrutiny of recent First Amendment cases like United States v. Stevens, United States v. Alvarez, Brown v. Entertainment Merchants Association, Snyder v. Phelps, or, most importantly, Republican Party of Minnesota v. White. In other words, Williams-Yulee may be a signal of how the Court will approach regulations of judicial elections that—outside the judicial election context—would run afoul of the First Amendment. And it is Chief Justice Roberts who holds all the keys. Over a decade ago, in Republican Party of Minnesota v. White, the Court struck down Minnesota’s prohibition on judicial candidates announcing their views on legal issues likely to come before the judges if they win the election. Joining Justice Roberts’s Williams-Yulee opinion are four other justices, all of whom were either in the dissent in White, or would likely have been in dissent had they been on the Court a decade ago (Justices Kagan and Sotomayor replaced White dissenters Justices Stevens and Souter). But it took Chief Justice Roberts to turn a 4-justice dissent in White into a 5-justice majority in Williams-Yulee. Justice Roberts was not on the Court when the White case was decided, so we do not know how he would have voted, but the most important take-away from Williams-Yulee is that Justice Roberts may be more susceptible to regulation of judicial elections than his conservative colleagues on the Court. Perhaps the court would allow a fund-matching public financing scheme for judicial elections, akin to the one it struck down in Arizona Free Enterprise Club’s Freedom Club PAC v. Bennett. Perhaps the Court would permit limits on independent expenditures—the kinds of limits that are thought to be unconstitutional under Buckley v. Valeo and Citizens United. Perhaps it would permit complete bans on contributions to judicial candidates by litigants and lawyers that are likely to appear in front of them? Until yesterday, all of these options seemed to be off the table. Today, they are perhaps a little closer to the table than we thought. Williams-Yulee offers a glimmer of hope that the Court will grant states some flexibility in regulating judicial elections—flexibility that states do not have when it comes to regulating money in legislative/executive elections. In short, while I’m skeptical that Williams-Yulee itself makes much of a dent in the problem of biased elected judges, I am hopeful that the decision signals that the Court understands the scope of the problem. And if judicial elections are not going away any time soon (and they are not) and recusal is not the answer (and it is not), then our ability to preserve the rule of law and ensure judicial impartiality may hinge on the flexibility to regulate judicial elections that the Court will grant to states under the First Amendment. We will have to wait and see whether the Court is open to such an approach. When the Florida Bar bans lawyers or judges from personal solicitations, the Supreme Court will, in a five-to-four decision, uphold the ban against the resulting First Amendment challenge. Or so the Florida Bar now reasonably believes, having twice won in this fashion. Twenty years ago, the Bar first won in Florida Bar v. Went For It, Inc. (concluding that the “Florida Bar’s 30-day restriction on targeted direct mail solicitation of accident victims and their relatives withstands [First Amendment] scrutiny”). The second and (for our purposes) much more relevant case is now Williams-Yulee. The Supreme Court of the United States has just upheld Florida’s ban on personal solicitation of judicial campaign contributions. Joined by the Court’s so-called “liberal wing,” Chief Justice Roberts wrote the opinion of the Court blessing the ban. (Florida’s ban on judicial candidates personally soliciting money is based on the 1972 ABA Code of Judicial Conduct, and 29 other states have similar bans based on the 1972, 1990, and 2007 ABA Model Codes; for further background on the Williams-Yulee case, click here and here.) The opinion is partly a plurality opinion because Justice Ginsburg refused to join the part of the opinion concluding that strict (“exacting”) scrutiny applies to this judicial election regulation, which prohibits only a very narrow category of speech (i.e., a judicial candidate’s personal request for campaign money). Thus, the Court effectively lacks a holding on the applicable standard of First Amendment scrutiny. Five members of the Court (including Ginsburg), however, concluded that the canon is one of the “rare” regulations surviving strict scrutiny analysis. The majority opinion will further provide critical support against other challenges to campaign-trail regulations in judicial elections, including the Ninth Circuit’s upcoming en banc decision in Wolfson (which had been stayed pending the opinion in Williams-Yulee). The Ninth Circuit’s now-vacated panel opinion had relied largely on a distinction between (non-judge) judicial candidates and sitting judges — a distinction on which the Williams-Yulee opinion places absolutely no weight. Judges are not politicians, even when they come to the bench by way of the ballot. And a State’s decision to elect its judiciary does not compel it to treat judicial candidates like campaigners for political office. A State may assure its people that judges will apply the law without fear or favor—and without having personally asked anyone for money. . . . [A] State has compelling interests in regulating judicial elections that extend beyond its interests in regulating political elections, because judges are not politicians. The parties devote considerable attention to our cases analyzing campaign finance restrictions in political elections. But a State’s interest in preserving public confidence in the integrity of its judiciary extends beyond its interest in preventing the appearance of corruption in legislative and executive elections. As we explained in White, States may regulate judicial elections differently than they regulate political elections, because the role of judges differs from the role of politicians. . . . Politicians are expected to be appropriately responsive to the preferences of their supporters. Indeed, such “responsiveness is key to the very concept of self-governance through elected officials.” McCutcheon v. Federal Election Comm’n, 572 U. S. ___, ___ (2014) (plurality opinion) (slip op., at 39). The same is not true of judges. In deciding cases, a judge is not to follow the preferences of his supporters, or provide any special consideration to his campaign donors. A judge instead must “observe the utmost fairness,” striving to be“perfectly and completely independent, with nothing to influence or controul him but God and his conscience.” Address of John Marshall, in Proceedings and Debates of the Virginia State Convention of 1829–1830, p. 616 (1830). As in White, therefore, our precedents applying the First Amendment to political elections have little bearing on the issues here. [In her argument that the canon is fatally underinclusive,] Yulee relies heavily on the provision of Canon 7C(1) that allows solicitation by a candidate’s campaign committee. But Florida, along with most other States, has reasonably concluded that solicitation by the candidate personally creates a categorically different and more severe risk of undermining public confidence than does solicitation by a campaign committee. The identity of the solicitor matters, as anyone who has encountered a Girl Scout selling cookies outside a grocery store can attest. When the judicial candidate himself asks for money, the stakes are higher for all involved. The candidate has personally invested his time and effort in the fundraising appeal; he has placed his name and reputation behind the request. The solicited individual knows that, and also knows that the solicitor might be in a position to single handedly make decisions of great weight: The same person who signed the fundraising letter might one day sign the judgment. This dynamic inevitably creates pressure for the recipient to comply, and it does so in a way that solicitation by a third party does not. Just as inevitably, the personal involvement of the candidate in the solicitation creates the public appearance that the candidate will remember who says yes, and who says no. . . . The vast majority of elected judges in States that allow personal solicitation serve with fairness and honor. But “[e]ven if judges were able to refrain from favoring donors, the mere possibility that judges’ decisions may be motivated by the desire to repay campaign contributions is likely to undermine the public’s confidence in the judiciary.” White, 536 U. S., at 790 (O’Connor, J., concurring). In the eyes of the public, a judge’s personal solicitation could result (even unknowingly) in “a possible temptation . . . which might lead him not to hold the balance nice, clear and true.” Tumey v. Ohio, 273 U. S. 510, 532 (1927). That risk is especially pronounced because most donors are lawyers and litigants who may appear before the judge they are supporting. See A. Bannon, E. Velasco, L. Casey, & L. Reagan, The New Politics of Judicial Elections: 2011–12, p. 15 (2013). Further reading: The news coverage of this blockbuster and (result-wise) surprising opinion is mountainous. Some great notes on the opinions (including the dissents) are available at the New York Times, Huffington Post, Election Law Blog, SCOTUS Blog, and Wall Street Journal, just to name a few. PDF · Robert M. O’Neil · 68 Vand. L. Rev. En Banc 1 (2015). PDF · Ruthann Robson · 68 Vand. L. Rev. En Banc 15 (2015). PDF · Chris W. Bonneau & Shane M. Redman · 68 Vand. L. Rev. En Banc 31 (2015). PDF · David W. Earley & Matthew J. Menendez · 68 Vand. L. Rev. En Banc 43 (2015). PDF · Stephen J. Ware · 68 Vand. L. Rev. En Banc 59 (2015). PDF · Charles Gardner Geyh · 68 Vand. L. Rev. En Banc 83 (2015). PDF · Burt Neuborne · 68 Vand. L. Rev. En Banc 99 (2015). PDF · Michael E. DeBow & Brannon P. Denning · 68 Vand. L. Rev. En Banc 113 (2015). To highlight one particularly interesting essay of the lot, Prof. Ruthann Robson tells her story of being solicited (albeit indirectly) for a contribution, opines on the detrimental impact that Williams-Yulee could have on the interests of clients and lawyers, and discusses four cases, some expected (e.g., White and Caperton) and some unexpected (e.g., Shelley v. Kraemer), that should inform the result in Williams-Yulee. Her work is available here. Supreme Court to Permit Judges to Solicit Campaign Contributions Personally? (1) The Brennan Center posted a good summary of the case and links to all of the briefs, including the ACLU’s amicus brief (supporting judges who plan to mass-solicit money directly from anyone, including the lawyers and litigants who will appear before those judges) and the ABA’s amicus brief (supporting the Canon prohibiting such solicitation, whether in person or in writing). (2) Adam Liptak from the New York Times just published a good summary of the oral argument. (3) The transcript of the oral argument is here. The Justices’ questions generally fall along anticipated ideological divides (e.g., the conservative Justices seem to support uninhibited solicitation of campaign contributions and the liberal Justices seem to support more regulation in judicial elections). Justice Kennedy’s vote is key, and his few questions are not telling. Stay tuned. The Supreme Court has agreed to hear another case on the Code of Judicial Conduct. It has not explicitly done so since Republican Party of Minnesota v. White (and we all know how that one turned out; cf. also the Caperton and Carrigan opinions). Judicial candidate Lanell Williams-Yulee signed a mass-mailing in which she solicited contributions to her campaign. Not surprisingly for those who have read the judicial ethics code in effect in a majority of states, this conduct violated the prohibition against personally soliciting campaign contributions. “A candidate . . . for a judicial office that is filled by public election between competing candidates shall not personally solicit campaign funds. . . .” Fla. Code of Judicial Conduct Canon 7C; see also 2007 Model Code R. 4.1; 1990 Model Code Canon 5C. As the 2007 Model Code (but not the Florida Code) helpfully defines, moreover, “’Personally solicit’ means a direct request made by a judge or a judicial candidate for financial support or in-kind services, whether made by letter, telephone, or any other means of communication.” The Florida Supreme Court thus publicly reprimanded Williams-Yulee for violating the Canon, notwithstanding her complaint that the Canon violates the First Amendment “in that it limits a judicial candidate’s right to engage in free speech by prohibiting a judicial candidate from directly soliciting campaign contributions.” The circuits have split on the First Amendment issue, and Williams-Yulee sought cert on that basis. (Of note, her petition relies in part on the Ninth Circuit’s recent split decision invalidating the personal solicitation canon as applied to non-judges, but the Ninth Circuit has since agreed to rehear the appeal en banc this December. See Wolfson v. Concannon en banc petition and panel opinion.) In part because Williams-Yulee’s adversary (the Florida Bar) made the controversial decision to urge the Supreme Court to hear Williams-Yulee’s petition, the Supreme Court has agreed to do so. I need to mount an aggressive campaign. I’m inviting the people that know me best to join my campaign and help make a real difference. An early contribution of $25, $50, $100, $250, or $500, made payable to “Lanell Williams-Yulee Campaign for County Judge”, will help raise the initial funds needed to launch the campaign and get our message out to the public. . . . Thank you in advance for your support. As an editorial comment, let’s hope that at least five justices recognize the significantly coercive and corrupting effects of personal solicitation (both in reality and in appearance and both as to the judge and the contributor), particularly combined with the fact that the judges or prospective judges would be directly soliciting money from the same lawyers and parties who appear or will appear before them. The judge knows or learns that a party, a party’s lawyer, or the law firm of a party’s lawyer has made a direct or indirect contribution(s) to the judge’s campaign in an amount that would raise a reasonable concern about the fairness or impartiality of the judge’s consideration of a case involving the party, the party’s lawyer, or the law firm of the party’s lawyer. In doing so, the judge should consider the public perception regarding such contributions and their effect on the judge’s ability to be fair and impartial. There shall be a rebuttable presumption that recusal or disqualification is not warranted when a contribution or reimbursement for transportation, lodging, hospitality or other expenses is equal to or less than the amount required to be reported as a gift on a judge’s Statement of Financial Interest. The PA Code of Judicial Conduct can be viewed here. Before the ABA’s House of Delegates in a few days will be Resolution 108, which proposes to amend the Model Code of Judicial Conduct to address judicial campaign contributions and independent expenditures. When elective judges receive campaign contributions or benefit (or suffer) from independent expenditures, those judges must consider various factors to determine whether to recuse themselves from cases involving those spenders. Resolution 108, which is supported by the ABA’s Standing Committees on Ethics and Professional Discipline and the Association of Professional Responsibility Lawyers (among others), competently and fairly comprehensively addresses these considerations. To be sure, 108 is not perfect. For example, it arguably concedes too much to commentators by inserting two, money-in-politics concessions in the official comments: (1) “no inference about a judge’s actual knowledge should be drawn solely from the fact that reports of campaign contributions or independent expenditures have been filed by individuals or organizations as required by law and may be available as public records or in the public domain” [yet, as the Model and most state Codes acknowledge, actual knowledge can be inferred from the circumstances]; and (2) “The fact that a party, a party’s lawyer, or the law firm of a party’s lawyer has made a contribution to a judge’s election or retention election campaign in an amount up to the limit allowed by law should not, of itself, be a basis for the judge’s disqualification” [which of course does nothing to address high-contribution-limit jurisdictions, among other issues]. Resolution 108 is not perfect primarily because the ABA’s Judicial Division has, to editorialize, insisted that watered-down provisions prevail. And even when such watered-down-but-still-better-than-the-status-quo provisions prevailed in 108’s final version, the Judicial Division not only refused to sign onto 108 but issued a call to resist change and drafted its competing Resolution 10-B. 10-B simply asks states to review their own disqualification procedures individually. 10-B seems simply a roadblock to change, and to see it, note that Resolution 107 (which did essentially everything that 10-B purports to do) was passed in 2011, Caperton was decided in 2009, the ABA Judicial Disqualification Project began in 2007, and judicial campaign spending has increased significantly throughout this period (and will likely continue to increase in the future). In light of all of that time and all of those developments (to name just a few), the Judicial Division could create nothing better than a request that each individual state review its disqualification procedures? Or perhaps the Judicial Division no longer supports the concept of Model Codes? In sum, Vote for 108 — except that you cannot. Owing to the resistance from the Judicial Division, the Committees on Ethics and Professional Discipline just agreed to withdraw Resolution 108 (contingent on the withdrawal of 10-B). Thank you to the Committees for your efforts to date, but money and power are not easily defeated. “I am not concerned that you have fallen; I am concerned that you arise.” — Lincoln. The ABA Standing Committee on Ethics and Professional Responsibility has just issued a new formal opinion on a timely judicial ethics topic. The Ethics Committee has not addressed judicial ethics in its formal opinions for over four years (indeed, in the last thirty years, it has done so only three times; for the previous opinions, see here). The next question almost automatically becomes — to what issue does the Model Code owe this attention? Judicious use of ESM can benefit judges in both their personal and professional lives. As their use of this technology increases, judges can take advantage of its utility and potential as a valuable tool for public outreach. When used with proper care, judges’ use of ESM does not necessarily compromise their duties under the Model Code any more than use of traditional and less public forms of social connection such as U.S. Mail, telephone, email or texting. For the full opinion, click here. That the Standing Committee on Ethics and Professional Responsibility and the Standing Committee on Professional Discipline should proceed on an expedited basis to consider what amendments, if any, should be made to the ABA Model Code of Judicial Conduct or to the ABA Model Rules of Professional Conduct to provide necessary additional guidance to the states on disclosure requirements and standards for judicial disqualification. The committees have released their second draft of the proposed rule change, which omits several restrictions proposed in the first draft. In response, Cindy Gray and the American Judicature Society proposed a stronger and more comprehensive rule in several respects. That rule can be found on pages 18-19 of this document, which also contains the other commentary on the second draft. The committees have kindly decided to post another draft for comment before the proposed rule goes to the House of Delegates next year. UPDATE: The third draft is available here. Comments are due by February 22, 2013. Following the ABA’s Resolution 107 (re: judicial disqualification and campaign contributions), the ABA’s Ethics and Discipline Committees have released for comment a series of ethics amendments that would add greater transparency to judicial campaign contributions and other campaign support. A new Model Rule of Professional Conduct would guarantee that lawyers and law firms disclose their combined contributions to either an administrative court agency or the elected judge herself. (Although the details need some ironing, this is a good idea; read why here.) Furthermore, an amendment to the Model Code of Judicial Conduct would clarify when campaign contributions and other support (e.g., endorsements or campaign services) should result in the judge’s disclosure and recusal. The Committees will hear testimony at the ABA’s meeting next month in New Orleans. To read the proposed amendments in full, click here. Recent times have witnessed strong lobbying efforts to move states away from electing judges to appointing them. Opponents of judicial elections repeatedly argue that the general public does not want judges who are bought by contributors. Of course, voters do not want those judges, yet the electorate repeatedly rejects efforts to move away from an elected judiciary. When voters do choose judges, the conventional wisdom assures us that the results will be less partisan if the judges run in nonpartisan elections – where candidates run but do not disclose their political affiliation. However, empirical evidence does not support this frequent claim. Studies repeatedly show that judges elected in partisan elections are substantially more likely to be independent than judges selected in nonpartisan elections. People who bemoan judicial elections often attack two U.S. Supreme Court decisions that appear to politicize the judiciary. One is Republican Party v. White (2002), which recognized the free speech rights of judicial candidates. They similarly criticize Citizens United v. Federal Election Commission (2010) as a pro-business decision that recognizes first amendment rights of corporations or individuals to spend money to engage in their political speech favoring their candidates. Yet, White simply evens the playing field by overturning restrictions that were really a form of incumbent-protection legislation. So too, the controversy surrounding Citizens United is misplaced. It does not favor business at the expense of unions. Instead it gives all entities, including unions and individuals, free speech rights that the government cannot restrict, which is why the ACLU supported the position of the petitioner and opposed the Federal Election Commission’s regulation. Still others view Caperton v. A.T. Massey Coal Company, Inc. (2009) as a case that will force judges to disqualify themselves if a party is related to an independent group that had supported the judicial candidate. It is too soon to judge the effect of Caperton, but there are plenty of indications in the five-person majority that the case has little growth. It i[s] inevitable that money will flow into political campaigns: indeed, economic studies wonder why the major players do not invest more in these campaigns, given that so much money rides on the outcome. As long as politicians and judges decide billion dollar issues, there will be multi-million dollar campaigns. Fortunately, the empirical evidence to support the assertion that those who pays the money gets the judge they wants is decidedly mixed. 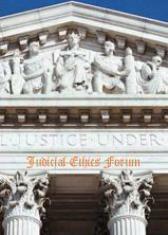 Ronald D. Rotunda, Constitutionalizing Judicial Ethics: Judicial Elections After Republican Party of Minnesota v. White, Caperton, and Citizens United, 64 Ark. L. Rev. 1 (2011). The Supreme Court just upheld Nevada’s Ethics in Government Law, which requires (in short) that public officials refrain from voting on matters in which they have personal interests. In this case, a city council member voted to approve a casino despite the fact that his campaign manager and close friend had a financial interest in the casino’s development. The Nevada Ethics Commission censured the council member, and in response, he brought a First Amendment challenge, claiming (among other things) that his vote constituted protected speech. Rejecting the challenge, the Court concluded (again in short) that recusal rules in these circumstances do not (and did not ever) violate the First Amendment. The Court was unanimous (as to the result, not as to the reasoning). The resulting opinions are relevant and indeed crucial for at least two reasons: (1) the seven-member opinion of the Court strongly validates the historical pedigree and constitutional legitimacy of American recusal laws, both legislative and judicial; and (2) both Justice Scalia (for seven justices) and Justice Kennedy (for his own pivotal self) noted that recusal rules may, quite understandably, be crafted more rigidly for the judiciary than for the legislature. Here is the full opinion: Nevada Commission on Ethics v. Carrigan; see also coverage at the Election Law Blog. In a recent move that has attracted much press, the New York State Administrative Board of the Courts has proposed a rule that would require attorneys who donate $2,500 and law firms that donate $3,500 to any judge be barred from appearing before that judge for a period of two years. This proposed rule is more flexible than a 2003 task force proposal, which recommended a five-year ban on attorneys who had donated over $500 to any judge. That proposed rule was said to be too onerous in the many less-populated areas, which often had only one full-time judge. To read more on this important development, click on one or more of the following outlets: Brennan Center (calling the rule “a victory for recusal reform”); NY Times (a “bold step”); and The Wall Street Journal (“It would be one of the strictest disqualification rules in the nation”); see also generally Keith Swisher, Legal Ethics and Campaign Contributions: The Professional Responsibility to Pay for Justice, 24 Georgetown J. Legal Ethics (forthcoming 2011). One of the most important recent developments in American legal theory is the burgeoning interest in “popular constitutionalism.” One of the most important features of the American legal system is the selection of state judges—judges who resolve thousands of state and federal constitutional questions each year—by popular election. Although a large literature addresses each of these subjects, scholarship has rarely bridged the two. Hardly anyone has evaluated judicial elections in light of popular constitutionalism, or vice versa. This Article undertakes that thought experiment. Conceptualizing judicial elections as instruments of popular constitutionalism, the Article aims to show, can enrich our understanding of both. The normative theory of popular constitutionalism can ground a powerful new set of arguments for and against electing judges, while an investigation into the states’ experience with elective judiciaries can help clarify a number of lacunae in the theory, as well as a number of ways in which its logic may prove self-undermining. The thought experiment may also be of broader interest. In elaborating the linkages between judicial elections and popular constitutionalism, the Article aims to shed light more generally on some underexplored connections (and tensions) among theories and practices of constitutional construction, democratic representation, jurisprudence, and the state courts. David E. Pozen, Judicial Elections as Popular Constitutionalism, 110 Colum. L. Rev. 2047 (2010), a link to which can also be found in Articles. Lawyers as johns, and judges as prostitutes? Across the United States, attorneys (“johns,” as the analogy goes) are giving campaign money to judges (“prostitutes”) and then asking those judges for legal favors in the form of rulings for themselves and their clients. Despite its pervasiveness, this practice has been rarely mentioned, much less theorized, from the attorneys’ ethical point of view. With the surge of money into judicial elections (e.g., Citizens United v. FEC), and the Supreme Court’s renewed interest in protecting justice from the corrupting effects of campaign money (e.g., Caperton v. A.T. Massey Coal Co.), these conflicting currents and others will force the practice to grow both in its pervasiveness and in its propensity to debase our commitment to actual justice and the appearance of justice. This Article takes, in essence, the first comprehensive look at whether attorneys’ campaign contributions influence judicial behavior and our confidence in the justice system (they do), whether contributions have untoward systemic effects (again, they do), and most fundamentally, whether attorneys act ethically when they contribute to judges before whom they appear (they do not, all else being equal). The article can be downloaded for free at this link, which can also be found in Articles. An instant classic, The New Politics of Judicial Elections, 2000-2009: Decade of Change, has been released for several months now. The study charts a decade of degeneration in judicial elections in the United States. Quite deservingly, the study has already received significant publicity (and it even comes complete with a foreword by Justice Sandra Day O’Connor), but we would be remiss not to mention it here as well. In short, the three liberal justices found disciplinable conduct in the ad’s misleading speech (opinion, here); the three conservative justices found the ad “distasteful” but not disciplinable (opinion, here). Now, the judicial conduct authorities do not know what to do with this tie. This same three-three split occurred recently in the much-followed case of State v. Allen, in which a criminal defendant moved to disqualify Gableman (in part for the remarks above). The resulting deadlock meant that the motion to disqualify was effectively denied. And as a final example, the split essentially caused the Wisconsin Supreme Court’s anomalous Caperton response (or more accurately, nonresponse); see earlier post for details. The Seventh Circuit weighed in last week on three common judicial ethics rules governing campaigns. Readers may recall that the Seventh Circuit is not shy about shaking things up in this area. [See Buckley v. Ill. Jud. Inquiry Bd., 997 F.2d 224, 230 (7th Cir. 1993) (striking down announce clause well before White came along).] To misappropriate Monroe Freedman’s famous term from another context, this new opinion is the latest in the growing “trilemma” of reconciling the First Amendment, Judicial Elections, and Impartiality (including its due process element). The rules at issue this time around had prohibited three campaign practices: (1) joining a party; (2) endorsing partisan candidates; and (3) directly soliciting campaign contributions. According to the court, this is how each rule fares, respectively: (1) unconstitutional; (2) constitutional; and (3) constitutional. The full opinion, with dissent, can be found here (Siefert v. Alexander). Readers may recall that the district court in early 2009 struck down all three prohibitions under First Amendment strict scrutiny analysis.